The guiding spirit of this string trio is the eminent Mark Lubotsky, one of whose most famous recordings was of the Britten Violin Concerto, though his most extensive involvement on disc is the music of Schnittke. He is also a formidable exponent of Tubin. 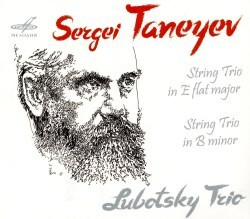 It’s usual to tie threads together by presenting all Taneyev three string trios together. The Leopold on Hyperion, Belcanto on MDG and other ensembles do precisely that, and that makes a Building a Library case simpler. But for some reason Lubotsky and his confreres have chosen to present only the Op.31 and the most well-known of the trios, that in B minor. Given what I must note is their heavily distended approach, rich in rubato and paragraphical wanderings, this is a dangerous policy especially because there should have been room for the D major, unless of course their approach to that work was so slow that it breached the half-hour mark. Which, given the precedent of the other two, is certainly not impossible. The church acoustic is warm but inevitably blunts articulation somewhat, creating something of a bloom around the trio’s corporate sound. There’s little that could definably be called ‘con brio’ about the opening Allegro of the E flat major with a conception that throughout remains rather static. The polyphonic elements of the Op.31 are thus rendered less than malleably, and the trio as a whole is inclined to fracture into incidents rather than coalesce. There’s no doubting the sweet-toned lead from Lubotsky or the touchingly warm slow movement, though its length is inclined to be (relatively) heavenly in this performance and some of the cello’s winding ascents sound laboured at the adopted tempo. It’s always a precarious business to judge performances by the stopwatch but the Lubotsky is a good five minutes slower than the average performance of this trio and their B minor, a more compact two-movement work with an opening Allegro followed by a theme and variations, is also significantly longer than the competition. Clearly this is a consistent conception. Full of alluring themes and with a series of variations that can seldom fail to appeal, this is a most attractive work but the performance, for all its wealth of colour and affectionate detail, sounds oddly statuesque. Given the foregoing, my choice now would be the Leopold on Hyperion.